Ballpoint, Rollerball, or Gel: Which Pen is Best for You? With so many choices of pens out there today it can easily get a bit confusing – do I need a ballpoint, gel or a rollerball pen? Having such a wide choice to choose from though isn’t a bad thing as it gives you plenty of options when looking for a pen to fit your needs. One of the questions that we are most often asked is what is the difference between these pens and how does this affect how they write? We’ll start with some of the basics and explore the differences between ballpoint pens, rollerball pens and gel ink pens to help you make a more informed decision when choosing your next pen. What all the labels basically come down to is ink. Even more simply put, thick ink or thin ink. Thicker inks dry quickly, last longer and make neat, but uninspired lines. Thinner inks dry more slowly and run out faster, but make sharper, more vibrant lines. Pens generally are classed by the types of ink they use and their delivery system. These use a thick, oil-based ink that is essentially a paste. A ball at the tip of the pen picks up the paste and presses it onto the paper. The ink is carried in an alcohol solvent, which dries quickly, leaving the ink stuck to the paper. Obviously, the advantage to ink that dries quickly is that it’s less likely to smudge. And, because the ink is thick, less of it comes out as you write, so ballpoints tend to last a long time. The ink is also far less likely to bleed through the paper. However, the thick ink is more prone to clumping and takes more writing pressure to apply to the paper. Since you have to press harder, it makes for a less comfortable writing experience. Due to their longevity and ease of care (you don’t need to do much to maintain a ballpoint pen), and the fact that ballpoint pens can write on many different types of surfaces, they remain a popular option for everyday life. Here are some details on a few of our favourites. Paper Mate InkJoy ballpoint pens have a wide range which all feature Paper Mate’s unique low-viscosity ink combined with optimised tips, meaning these pens start to write quickly and smoothly with minimal pressure, giving you crisp, clean lines exactly where you want them. Pilot ballpoint pens offer affordability with comfort, longevity and environmentally-friendly options. The Pilot BPS range of capped, stick ballpoint pens features a comfortable triangular rubber grip with refillable ink, making them smooth-flowing and easy to use. The Pilot Acroball ballpoint pens feature a hybrid ink which combines the best qualities of fast-drying liquid ink with a quick-drying ballpoint pen, giving you smudge and water-resistant, archive quality writing in the ease of a ballpoint pen well suited for left or right-handed writers. If you are looking for something a little more expensive, the Parker Jotter and the new Urban range are firm favourites of ours. The Jotter has been one of the most popular pens in the UK since 1954, with good reason. Their sleek stainless steel style is combined with their unique ink system, ensuring a smooth, consistent flow of ink for your writing. The new Urban line has a unique bullet-shaped barrel to make it smooth and comfortable for right or left-handed writers. Parker ink is water-based so it ensures a deep colour appropriate for any paper, making these pens an easy choice for many needs. 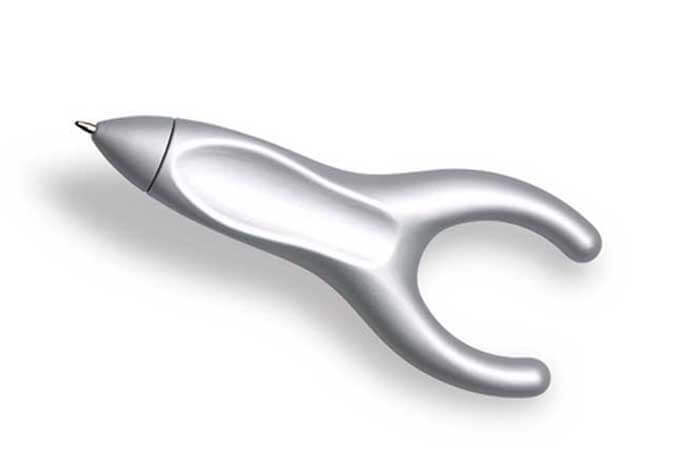 If you are looking for a pen which will relieve the strain of writing, PenAgain has an ergonomic Y-shaped wishbone pen specifically designed to let the natural weight of your hand supply the pressure needed to produce a smooth, vibrant line, alleviating writer’s cramp and repetitive strain injuries. For a truly versatile pen, the Fisher Space Pen is a top contender, coming with a pedigree that includes actual space travel. This pen was designed for use anywhere. Being pressurised, it can write upside, under water, or on almost any surface, with a compact bullet shape that makes it fit handily in your pocket or purse. Rollerball pens use a thinner, water-based ink that comes out as a liquid (which is why you also see them referred to as liquid ink pens). The design is basically the same as a ballpoint: a ball held in a cone-shaped or pronged tip that picks up the ink and rolls it onto the paper. The solvent, water, is slower to dry than alcohol. Some considerations to keep in mind include the fact that since the ink dries more slowly, it is more prone to smudging, especially for lefties whose hands drag over the lines as they write. The thinner ink also flows out of the pen at a faster rate, so the ink cartridges have a much shorter life than ballpoints. Also, paper absorbs the ink more readily, so bleed-through is a concern. The main advantage of these pens over standard ballpoints is that the ease of flow makes writing extremely smooth, and the richer saturation is just more attractive. The Pilot V-System range of liquid ink rollerball pens all feature a regulator system for the ink flow, ensuring smooth writing to the very last drop of ink. Available in a range of widths and colours, the precision and longevity of these pens have made them a favourite for many years. The Uni-Ball AIR rollerball features a unique rollerball tip which continues to roll smoothly at any angle, providing a dense line which is water and light-resistant. Combined with its comfortable feel, this makes the AIR an ideal pen for documents or any long-term writing. If you are looking for something a bit more upmarket or sophisticated for yourself or for a present, then the Waterman Hemisphere pens are excellent choice. OK, this is where it can get kind of confusing because this ink is used in both ballpoint and rollerball pens. The ink is a water-based gel that isn’t quite as thick as typical ballpoint paste, but isn’t quite as thin as rollerball liquid. It’s delivered the same, via a rolling ball. The idea of gel ink is to achieve a balance so that it dries quickly and is less likely to blot or smudge, but still flows freely enough to write more smoothly than a standard ballpoint. Because gels use pigments, rather than dyes, there also is more variation in the colours available. Gel pens, like liquid ink rollerballs, create bold, rich lines and tend to write quite comfortably. But the thicker ink also tends to clump occasionally, like ballpoint ink, and doesn’t always coat the ball evenly, leaving skips in the line. With these considerations in mind, we have some recommendations for you in the gel pen arena – pens which we feel deliver the best combinations these pens have to offer. Today’s much-loved gel pen craze started when the renowned company Sakura introduced the first gel pen with the Gelly Roll pen in 1984. Since then, their innovations continue with gel pens available in pastels, vibrant colours, metallic, glitter, even 3D inks – countless options which make them a favourite brand for anyone doing arts and crafts or just bringing a spot of colour to their writing. The Pilot G2 07 pens are probably the most famous and written-about gel pens in the world featuring a fluid gel ink with vibrant, intense colours. These pens are available in a wide range of 26 colours to choose from so you can add a dash of colour to your work or art or you can express yourself over an entire page in the colour that best suits your needs and mood. These ergonomic pens have a rubber grip and a retractable tip to add comfort and ease to your writing. Another popular option in the gel pen range is the highly versatile Pilot Frixion pen range. This line of erasable gel ink pens means that you can select the vibrant look you desire for your writing and then easily correct any undesirable mistakes that may occur – the best of both worlds! The Pentel EnerGel pen range is another popular option, especially for left-handed writers. The EnerGel ink is specially formulated to combine liquid and gel ink for an intense colour line which dries quickly and helps prevent smudging. If smudge-free writing is a priority for you, check out our post here with additional information and recommendations. Hybrid ink pens represent a fairly new development in ink pen technology. Taking the best features of a ballpoint pen, namely the ability to write on most surfaces with a quick-drying ink, combined with the intense colours and smooth, dense flow of gel ink, hybrid pens cover all of the bases. The ink produces a line which is as even as the line provided by a gel rollerball pen, but resists drying out, also giving you the longevity of a ballpoint pen. There are several ranges of pens available now which feature this hybrid ink, but there are a couple of standouts which we recommend. Uni-Ball was the first to introduce this new hybrid ink in their Jetstream range of pens. The pigment-based inks make the Jetstream range fast-drying pens with dense vibrant colours that do not smudge, making them ideal for left-handed writers. Their intense colour also bonds with paper, making the Jetstream pen terrific for signing documents or using when you want archival quality and longevity for your writing. The Zebra Z-Mulsion range is another line which features an emulsion of oil and pigment to give you an ink that is the perfect balance of a gel pen and ballpoint pen with vivid, bold colours to add flair to your writing or art. So which one is best for you? That really depends on the type of writing you do the most, and what your priorities are when choosing a pen – the cost, the writing experience, or the way it looks on paper. Ballpoints use less ink, which means buying fewer refills, and they’re less prone to drying out when not in use. They’re dependable, inexpensive, everyday writers that will get the job done. Rollerballs float across the paper nearly as smoothly as fountain pens for the most graceful, comfortable writing experience. You can use them for long periods of time without cramps or fatigue. Gels produce the cleanest, most precise lines without sacrificing vibrancy. They’re perfect for adding bold signatures to documents, for writing journal entries, or for artwork. Your best bet probably is to start out with a good ballpoint or gel pen and try using it for a while. You can always trade up if you want a smoother writing experience and don’t mind the added expense. But we’re betting that once you pick up the right pen, you’ll be perfectly happy to stick with it. That’s our take – but we want to hear from you. Which pen is working best for you right now? None of the above- why compromise when you can use a fountain pen? What kind of fountain pen do you carry with you for daily use? Well written informative post that is sure to clear some misconceptions and faciliate selection decisions. If you peer closely at ballpoint writing samples, it’s remarkable just how messy and nasty they can be. I haven’t experienced the clumping or skipping with good quality gel ink refills, unless they are getting old. Pilot G2s are good and available everywhere; Zebra JFs are better but harder to find. These are generally interchangeable with Schmidt rollerball refills, they can be used in the same pens. In my opinion, gel ink can and should displace liquid rollerballs completely. My top choice is still for a fountain pen, though. The Pelikan 200 and Lamy 2000 are a couple of my favorite mid-price choices. You can move up or down from there, as your budget and preferences dictate. There is also waterproof, archival and tamper-proof security ink now available for fountain pens, thanks to Noodlers. I suggest avoiding cartridges, as your choice of ink would be quite limited. All the really good stuff comes in bottles. I’ve heard quite a bit about Zebras, but haven’t used one yet. They’re on my list of pens to try. The problem I have with fountain pens is that my pen use is more often done on the fly than sitting at my desk — probably about 65/35 — and FPs don’t strike me as a “field” kind of pen. I prefer pens that I can mistreat, including occasionally chewing, and stick in a pocket without having to worry that it will leak all over me. So far, the G2 fits that bill pretty well. I just wish it had a wider grip. I think my dream pen would have the firm click-action and smooth flow of the G2, and a barrel the size of the Bic XXL, except with a gel grip instead of foam. And since we’re dreaming, it also would have a sleek black lacquer and stainless steel design, like a Parker, for the price of a disposable. Gel pens of good quality and from manufacturers of reputed cos. are really adorable, so is the Roller pens. They provide real comfort. But, while you are providing some sensitive info and or writing a cheque/check (US spelling), you must be , prone to, double check the instrument of transaction, so that , it can’t be tampered with or never smudged by sweat or water, it should preferably a ball point pen. And nowadays fountain pens are not in the vogue…it i s a passe. Gel pens are supposed to be the way to go as out have the best of both worlds. I use a uni ball jetstream SXN210 which I love. The only thing with this is that I would like the same feel with a more classier/ permanent pen. Is it the pen or the refill that makes the difference. If its the refill I would go and spend more money on a permanent pen and just buy the refills to get the same feel. One note: the uniball jetstream is used as an example of a rollerball pen. The jetstream is not a rollerball (the uni vision is). The jetstream is a hybrid between a ballpoint and a gel pen. Also, the jetstream is by far my favorite non-fountain pen. I Think there is one is not listed there that is good, The LAMY Safari Fountain Pen is Really Good to write with! For good handwriting atpresent GEL pen is best one. Previously I used to write fax message with /gel / Black ink pen so that the receiver can get very good ligible copy of fax because of /gel/. For the last 25 years I am using different type of pens for articles writing and still writing. I worked as a steno/secretary for 13 years and I used to take dictation with Balll point pens only. My hobby also is pen collections. I also gifted Ball point pens for friends/school childrens for birthday/exam redults etc. thanks and regrds. Atpresent Gel pens are best for good handwriting. I worked as a Steno/Secretary for 13 years and I used to write dictations with ballpens enable me to complete without ommission. While taking dictation with pencil, ball point pen can write more faster than pencill. Everyday for the last 30 years) writing minimum two pages newspaper writing with ball pen or gel pen. I vermuch interested for gel pen only. For new collection of gel pen I request my brothers at Bombay to bring latest Gel pen everytime whenever they are visitng my place. FYI now my collection of balllpoint pens are morethan seventy including Gel. Why to think about this so much just use pencil buddy HAAAAAAA!!!!! Usually gel pens are best. They give a better appearance. During exams you may use gel pen…..during normal studies you can use ball point pen. I am a penturner. I do enjoy FPs but I find them impractical for on and off writing. I find even the best Schmidt non-drying RB refills to get thinner (med to fine, fine to very scratchy…then dry) even when I am fastidious about capping the pen immediately after writing. I really like the MV gels, but find them to dry out or run out very quickly. I find the Schm 9000 series to be the smoothest and last the longest, but I still prefer the gels. maybe I need to try other refills. Oh yeah, I also use the Fisher refills – I find them not as smooth, but long lasting and perform as advertised. All of the above are Parker-style refills. Does anyone share my experience? Thank you. The only pen that anyone needs is a Zebra F-701. It’s not perfect, but it’s as close as it gets. No pen will match a Cello Gripper 0.5 mm ball point pen made in India costing equivalent of 9-10 cents (US). I live in North America and have used Pilot and Uni Ball. But Cello is the best in the world. Fine, uniform, smooth and clear writing. You may check it once. I miss the pen. I adore the Fischer Space Pen and I am an avid collector! I have about 12 in all. They never run dry and can write on most surfaces including underwater although I’ve never tried that?! Has anyone else? They are so tactile but can be rather slippery especially the highly polished chrome finish. I love the different coloured inks including burgundy and purple and even invisible! They never let me down and they are so well engineered and robust. Primarily ballpoints but they do an immense range now. My fave is a solid brass gun cartridge model. Fisher Space pens are among my favourite pens I always have one handy because they are so reliable and just write when you need them to no matter where you are.